Marcus & Millichap is pleased to present for sale The Flats at 31 Brewerytown – 114 new construction units located in the Brewerytown neighborhood of Philadelphia. The Flats at 31 Brewerytown is a 114-unit Class A apartment building that was constructed in two phases from 2014-2015. The property features spacious one- and two-bedroom apartments and townhomes, all of which have modern high-end finishes. There is a ten-year tax abatement until December 2024 and January 2026. Marcus & Millichap Philadelphia’s Andrew Townsend, first vice president investments, along with partners, Ridge MacLaren, senior vice president investments, Clarke Talone, first vice president investments, and Will Riter, associate, are exclusively representing the seller, Westrum Development Company. Westrum is a leading residential real estate developer in the area, that spearheaded the revitalization of Brewerytown. Notably, the property features a 1:1 ratio of off-street parking, as well as attached garages. The spacious units average 883 square feet in size, which is larger than comparable luxury buildings in the submarket. Units feature gourmet kitchens with granite, stainless steel appliances, 9-foot ceilings, in-unit washer/dryer, and contemporary track lighting. Rents at the property are $1.73 per square foot, which is well below the average in the market. This is a major draw for tenants looking to live the city lifestyle in a highly desirable location at a lower cost, in comparison to similar Center City neighborhoods. Due to the low rent per square foot and current occupancy of 96 percent, The Flats at 31 Brewerytown is primed for future rent growth as the area continues to mature and thrive. The rapidly developing neighborhood of Brewerytown is ideally situated minutes from the Schuylkill Expressway (Interstate-76), just north of Center City. The neighborhood is bordered by Fairmount Park to the west, as well as the neighborhood of Fairmount to the south, home to Philadelphia’s world-class art museums. 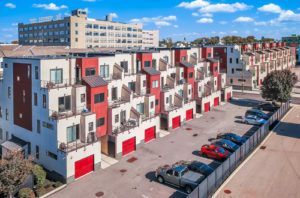 The Flats at 31 Brewerytown is walking distance to a brand-new Aldi grocery store, numerous dining and nightlife options, as well as the Philadelphia Zoo. Public transportation is a short walk away, including SEPTA bus routes and SEPTA Route 15, a heritage streetcar line that runs through the neighborhood and connects to Girard Station, which provides easy access to Center City via a ten-minute subway ride. Click here to view additional details about this listing, or give us a call at 215-531-7020.